After reading the article, I kept the message. I love to travel and was in the midst of planning a trip to Nevis. 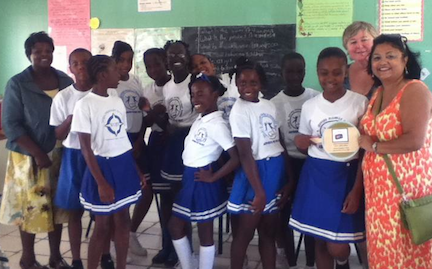 I was shocked to see that there was a school in need of school supplies in Nevis. But how do I give up ½ of my luggage, I thought to myself. Well the day before I left, I decided to go ahead and get some school supplies: a dozen coloring books, crayons, pencils, flash cards and glue (roughly 20 lbs). I was born on the island of Trinidad and for some reason, I felt it was not right to vacation in a place knowing there were children in need of supplies. headmaster. 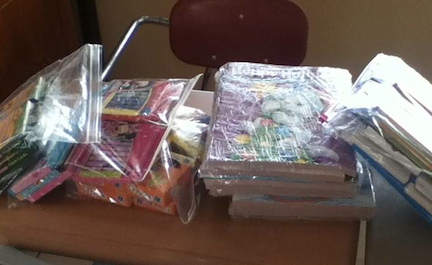 My tweet sums it up “Enriched by the students at VJON Primary School, Nevis 20 lbs of school supplies”. The headmaster introduced us to each class, K-6, roughly 12 students per class. The students stood up and greeted us by saying, “Welcome to VJON Primary School, thank you for coming and have a nice day”. As we were leaving, we told the headmaster we were nurses and she quickly took us to the first grade teacher who was setting up a “sick bay” and was in need of first-aid supplies. Her name is Suzanne and she is so inspiring, building a small sick bay with a cot and cupboard. When I looked at the children, I thought, I was once in a school house much like this, they have so little and at the same time, so much to look forward to. I want to thank @anntran for posting the message, for Nesbit Plantation for supporting the school and Pack For A Purpose for supporting this great cause. I will keep in contact with Suzanne to provide her with some basic first-aid supplies.